For years, the Name-givers – those races gifted with the ability to Name, and shape the very magic of the world – were forced to live in underground citadels known as kaers, while malevolent creatures from astral space, so terrible they could only be called Horrors, ravaged their world. The time of hiding has passed. Now, the Name-givers have returned, and reclaimed their place in the world. The fight is not over. The Horrors still linger in this world – in the cities and ruins lost during the Scourge. A corrupt Empire seeks to reclaim its provinces, and Name-givers with dark ambitions seek to set themselves up as the new power in the absence of the Empire. In this Age of Legend, only heroes can stand against the soul-rending power of the Horrors, and the dark machinations of those corrupt with power. 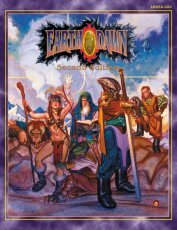 Become these brave souls, and roleplay in Earthdawn, the Age of Legends." "During the Scourge, the Horrors ravaged the world unchecked while we were forced to hide in the magical citadels and kaers. It was only through the magical traditions passed down from generation to generation that we were able to face these evil entities, and reclaim what was ours. new battles call for new ways, however, and the power of tradition has grown stronger, augmented with the knowledge of a people at war with the creatures that would destroy our world or those who seek to claim it for their own power-hungry purposes. 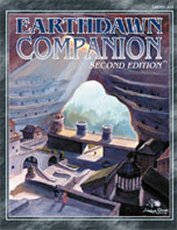 The Earthdawn 2nd Edition Companion takes up where the Earthdawn 2nd Edition Rulebook left off. This book provides Earthdawn players and gamemasters with guidelines for advancing characters well beyond the limits set in the basic rules. The Companion includes dozens of new talents and spells, and systems for large scale battles. The Earthdawn Companion also expands the workings of magic in Earthdawn, as well as providing rules for playing questors of the Passions." 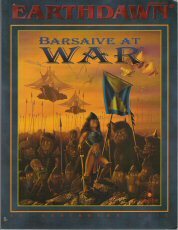 Barsaive at War is a campaign supplement for Earthdawn. It introduces eight significant events, which outline an epic-style campaign. Each of the events can also stand alone, to form mini-campaigns. Taken together, the characters are placed in the center of a story that changes the face of Barsaive, and its future, forever. Barsaive at War is intended for characters Fourth Circle and above, of any Discipline." "The war is over. The Therans have been removed from Barsaive. Everything should ke fine now, right? That couldn't be further from the truth. The Horrors are still out there, and their threat is ever-present. 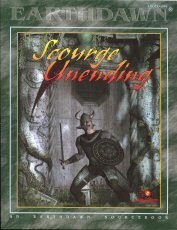 Scourge Unending is a sourcebook covering the Tainted entities that can be found in Barsaive. It updates the beings detailed in the Book of Horrors, and introduces new powerful Horrors and Horror Constructs. Included in Scourge Unending are dozens of plot hooks and all the rules you'll need to bring these Horrors to your Earthdawn campaign. Scourge Unending can be used in campaigns of any Circle." "Adepts are the heroes and legends of Earthdawn, fighting to reclaim their Scourge-ravaged land with the magic they wield. Some of these Adepts find their path defined by conflict and blood, a path known to some as the Way of War. Archers use their power to master the art of the missile weapon. Cavalrymen use their empathic bond with their mount to become fearsome fighters. Sky Raiders harness their magic to help them plunder the skies of Barsaive. Swordmasters are quick with both their well-handled weapons and their dangerous wit. Warriors use their talents to become the personifications of war. And the Zhan Shi introduces mastery of unarmed combat from distant Cathay. 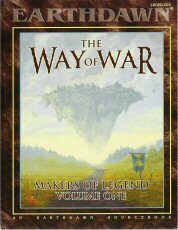 Way of War: Makers of Legend Vol. 1 offers players and gamemasters an in-depth look at five Disciplines of Barsaive. This book describes these five Disciplines from the point of view of four different Adepts, and introduces a new Discipline, the Zhan Shi. Way of War also includes new talent knacks and new rules for using the Disciplines in Earthdawn adventures." 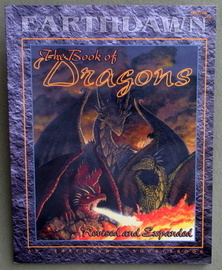 This is The Book of Dragons for the Earthdawn Role Playing Game. Inside, the Great Dragons of Barsaive are detailed, as well as other influential adult dragons. The Book of Dragons contains all the rules necessary for including dragons, in all their might and majesty, as well as dragon-like creatures in your Earthdawn campaign. Finally, the The Book of Dragons' adventure frameworks can immediately involve your campaign in the affairs of dragons. "Adepts are the heroes and legends of Earthdawn, striving to reclaim their Scourge-ravaged land with the magic only they wield. Some of these Adepts find in their wanderings that they are defined not only by their Discipline, but also by the other name-givers and creatures they interact with. Air sailors crew the airships that fly the skies of Barsaive. Beastmasters use their magic to bond with animals. Scouts explore the wilderness and delve into hidden kaers. The self-reliant Thieves know how to sneak, and to steal. Troubadours serve as entertainers, storytellers, actors, and songsmiths. And the Montebanc introduces the art of manipulation practiced so commonly in the courts and cities of Arancia. 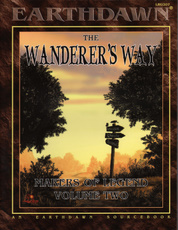 The Wanderer's Way: Makers of Legend Vol. 2 offers players and gamemasters an in-depth look at five Disciplines of Barsaive. This book describes each of these five Disciplines from the point of view of four different adepts, and introduces a new Discipline, the Montebanc. The Wanderer's Way also includes new talent knacks and new rules for using Disciplines in Earthdawn Adventures."